Flux Goes to Collision Conference 2018! THINK FAST! What do Al Gore, Wyclef Jean, Brad Smith (the Pres. of Microsoft), Sophia Bush, and Flux’s own Katie Hillman and Bridgette Ortiz have in common?! This year was my first year attending-- and my first year at a tech conference in general. The event was definitely not what I had expected (I guess I had envisioned less variety of topics and more hands on technical demonstrations? Just less...hip? Exciting? Shiny?) but it was a really great experience! Firstly, Collision attracts people from all over the world-- they travel from India, New Zealand, England, etc. to attend. Which is great both for in conference conversation and the New Orleans economy! As an evaluator, I was a rare breed compared to other attendees. Most people I talked to were unsure of what evaluation was, and extremely unsure of how it operated in the realm of social impact. So, that was an exciting opportunity to be able to share what we do with a new array of people. I also got to learn about the exciting things happening in the techier realm of the world-- everything from apps people were creating to innovate for medical problems, advances and developing ethical issues in AI, the increasing female presence in tech (and increasing leadership roles for females!! ), to the pros and cons of utilizing remote workers in your business! While I could talk about the things I learned and opinions I heard all day, I’ll bring it back to evaluation. 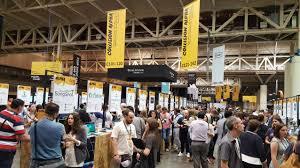 As we’ve mentioned before in these blog posts, evaluation is a somewhat smaller professional field, and its presence is even lighter in New Orleans. But, our heavy use of data and reliance on technology made me think I would encounter more evaluators than I did. (Which was none, if you were wondering.) Granted, I did not meet everyone at the conference… but none of the speakers were identified as evaluators. I think as a field we have much to offer and gain from this techier realm-- and it would be an awesome goal to have more overlap! Maybe next year’s Collision Conference (in Toronto, Canada) will boast some evaluators on their speaker list. But until then, I encourage you all to explore the options tech provides for us! If you have any questions or comments about Collision Conference (your experience or mine), let me know at katherine@fluxrme.com!